As you might have read in my previous post, when my husband and I moved into our house in October of 2009 we received furniture from his relatives – including a dining room table and chairs from his mother. The set was high quality, but over the years it had taken a beating on it’s finish and the wood finish itself just didn’t match our contemporary style… Especially our orange kitchen walls and hardwood floors. I decided that instead of hunting for new furniture, I should breathe some new life into the set and make it our own. Here’s how I did it. 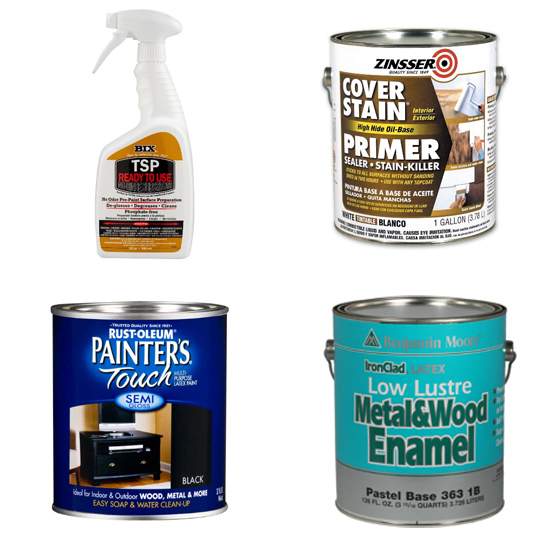 Before starting this project I searched around the web for information on refinishing furniture. The last thing I wanted to do was sand all of this furniture, especially with the detail in the legs. While searching, I stumbled upon this blog post from the “Just a Girl” blog. So I set out to get the supplies she recommended. When I arrived to the Benjamin Moore store to purchase the Metal & Wood paint, I think my heart and wallet skipped a beat when I heard the $25 price tag for a quart of paint. I mean, the main reason I wanted to refinish this dining set was to save money – not spend just as much as I would buying something new! I decided I should purchase the can anyways, and see if I could find something else to use instead. I found the TSP, Zinsser Cover Stain Primer, and miscellaneous supplies at the Home Depot, and decided I would give RUST-OLEUM’s Painter’s Touch product, a mere $9, a try before going all out on the expensive Benjamin Moore product. After all, both products boast a durable finish that will adhere to metal and wood and work both in and outdoors. I started by laying down my drop cloth under the table. With my hardwood floors, this was very important – not just because I didn’t want paint on my floors, but because the TSP product will degloss anything with a finish. I decided to spray the TSP product directly on to the table top, but opted apply the product to the rest of the table via a paper towel to minimize the risk of getting any on my floors. *As a side note, make sure you have good ventilation for this step and the priming step as the products have very potent smells that will make you woozy. Next I decided to lightly sand down my table top. 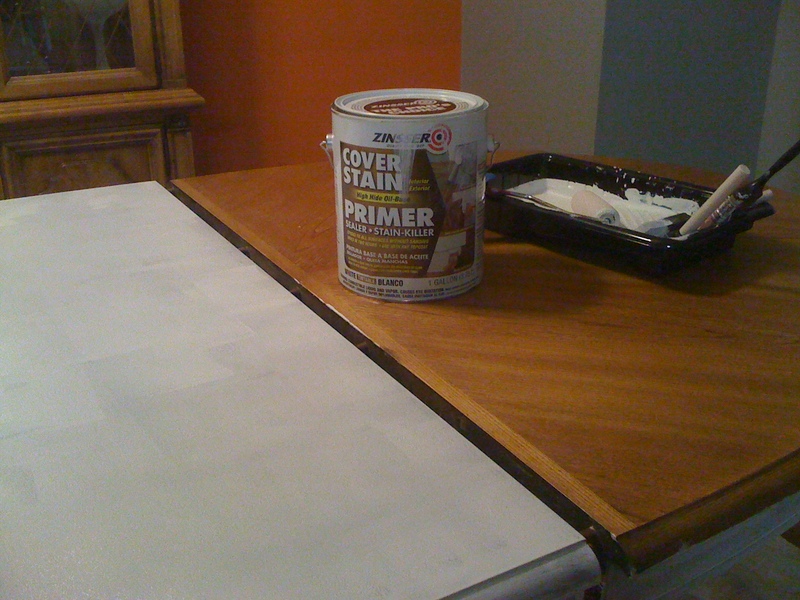 Technically you don’t have to do this step since the Zinsser Cover Stain Primer doesn’t require sanding before you apply it… But my table top had an uneven finish and I wanted to make sure I could get it as smooth as possible. After sanding the table top, I wiped it down to remove any dust, and moved on to priming. I used a foam roller to prime the top of my table and used the foam sponge brushes for the rest of the table. When you are finished – either throw your roller and sponge brushes away, or use paint thinner to clean them. Because this primer is oil based – you will not be a happy camper if you attempt to clean them with soap and water. In the end I was really pleased with how the RUST-OLEUM product came out. 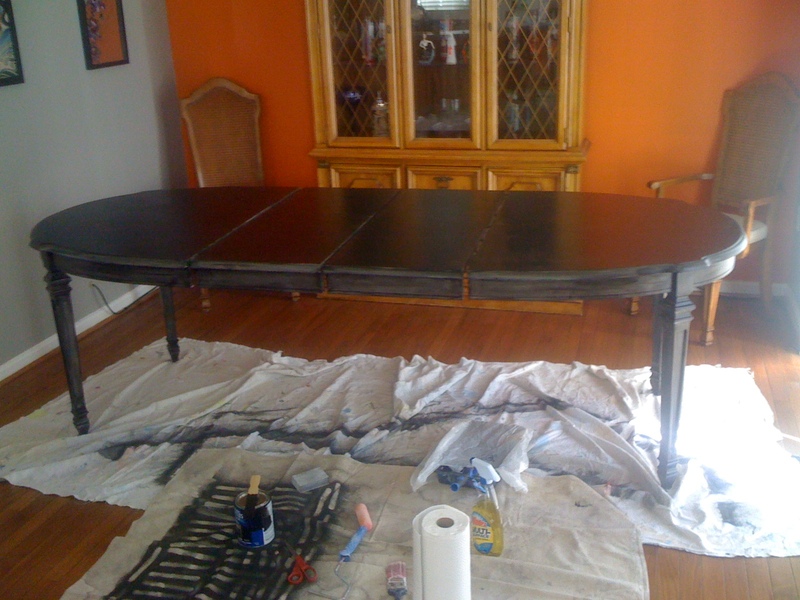 I did decide to do the final coat on the top of the table with the Benjamin Moore product. Why? My mother (I love her) convinced me that it was probably worth it to coat the “high traffic” area with the “high quality” product… But I bet the RUST-OLEUM itself would have worked just as well. If I had something I would have changed, I probably would have opted to use a oil based paint for at least the table top. I found that the latex paint started to dry and get tacky while I was rolling the table top, trying to get a smooth even finish. Overall, I couldn’t be happier! It was a little work, but well worth it in the end. In my next post I’ll go over how I refinished the Cane-Backed Chairs. Thank you for posting this project on-line. I recently purchased a dated Caned dining room chair and table and hutch set, and have decided to update it by painting it. Having no idea where to start, it’s so helpful to find a post such as this, and particularly you listing the products and tips. 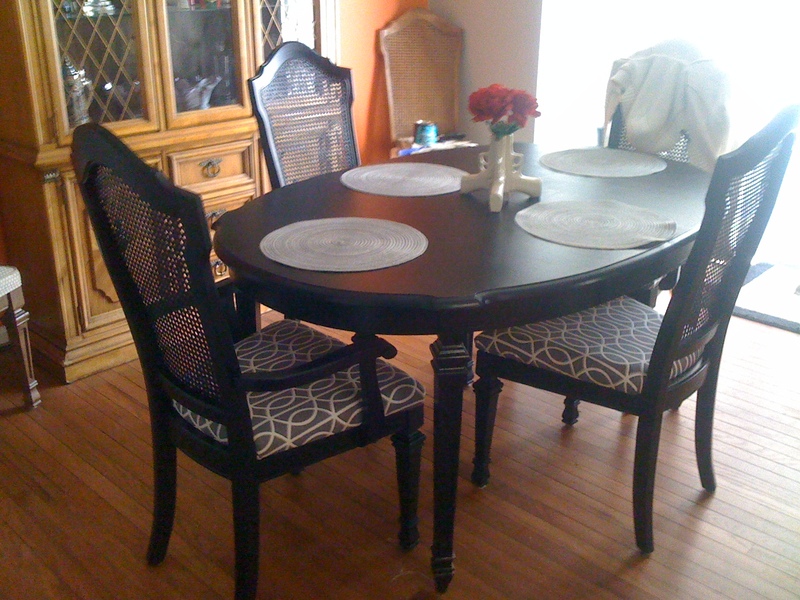 Your dining room set looks beautiful, and I’m excited to get started on mine. Can you please share what color you used on your set? i am about to attempt my first re-finishing project. i found a wonderful roll-top desk and want to paint it for my daughter’s room. it is solid oak. do i need to strip off the finish, or can i just prime it with the zinsser stuff? I didn’t strip the table or chairs at all! I just used the TSP degreaser and the Zinsser primer. It has held up very well. I’ve even used this method on the kitchen cabinets in my townhouse. you have inspired me! i am going to get some of the products today and start priming! i hope that my project turns out as beautifully as your table did.